VideoSpeak allows you to easily add synthesized speech audio tracks to existing videos and movies. Its simple operation allows a voice-over without the use of a microphone or other audio equipment. How many times have you seen a demonstration or instructional video on YouTube which has no subtitles, and no narration. You are just left to guess what they are doing. Have you ever shot a video but then later wanted to add a description? VideoSpeak allows you to quickly narrate a video after you've finished shooting it, using high quality synthesized speech. Because VideoSpeak uses the built-in voices in OS X, there is no time-wasting setup of microphone or audio equipment. The multiple voices available in OS X allows VideoSpeak to easily add a narration with whatever voice you choose, including localized and regional accents. With VideoSpeak you can use different voices for each added speech track. You might want to appear to have two people talking to each other. 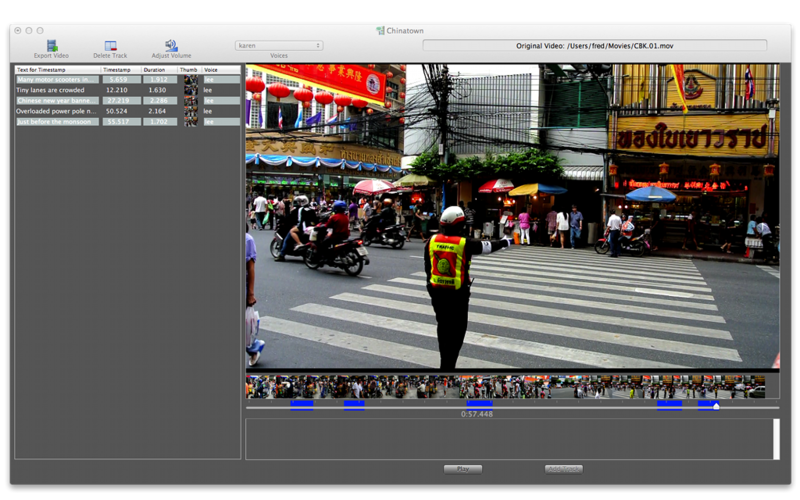 A completed video with added narration can be ready for export within a few minutes. VideoSpeak is ideal for creating speech tracks on instructional or training videos. Narration could be added to give life to vacation movies. Novelty voices can be used to add interest to funny videos. VideoSpeak is easy to use. Drag a video into the VideoSpeak application, and enter a project name. Then just choose a point in the video, select a voice, and type the text you want spoken at that point. Synthesized audio is then added to the video using the selected voice. Existing background audio within the movie is automatically reduced in volume, for each speech track added so that the speech can be heard more clearly. Once the user has finished adding the voices, the video is exported to a Quicktime movie file of a chosen size. The original video is never edited. 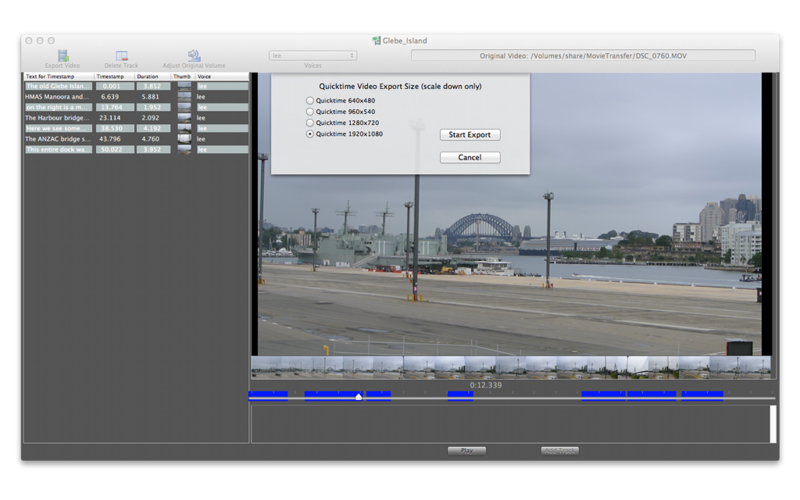 Instead the newly created video with added audio tracks is exported as a Quicktime file. Any Apple voices installed on your computer can be used, and each track can use a different voice. You can download additional voices from Apple for particular geographic regions or dialects, allowing you a wide variety of voices to choose from. Apple OS X supplies several voices for synthesized speech as standard. There are many other voices also available for free download for specific regions and dialects. For example, there are 22 English voices for 7 different regions or countries. (not including novelty voices); there are 6 French voices for 2 regions. If the background volume on the original video is too loud, or too quiet you can adjust this easily so that it matches the volume of new speech tracks. VideoSpeak automatically fades the background audio for the period that the new speech track is in operation. Can I buy direct or through MacZot? Must I buy from the App Store? MacZotHassle, You need to buy the App through the Mac App Store.